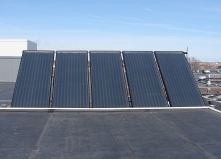 Sun-Power Solar thermal heating is a renewable energy converted from sunlight into thermal (heat) energy. More than 300,000 solar pool heating systems have been installed in the United States, providing efficient heating to residential and commercial swimming pools around the country. output of a typical nuclear powerplant. solar water heating system to replace its conventional one. lower than a conventional water heater. advantage of a federal income tax interest rate deduction.